Here it is! Embroidery Block 1 of the Hazel’s Summer Wildflowers Quilt-Along. (Or are you calling it Hazel Ilene’s Veritable Rubicon of Wildflowers?) My best friend has already dubbed hers “The Rubicon Quilt”, and she hasn’t even started yet! For these blocks, there’s a plain version, and a fancy version. 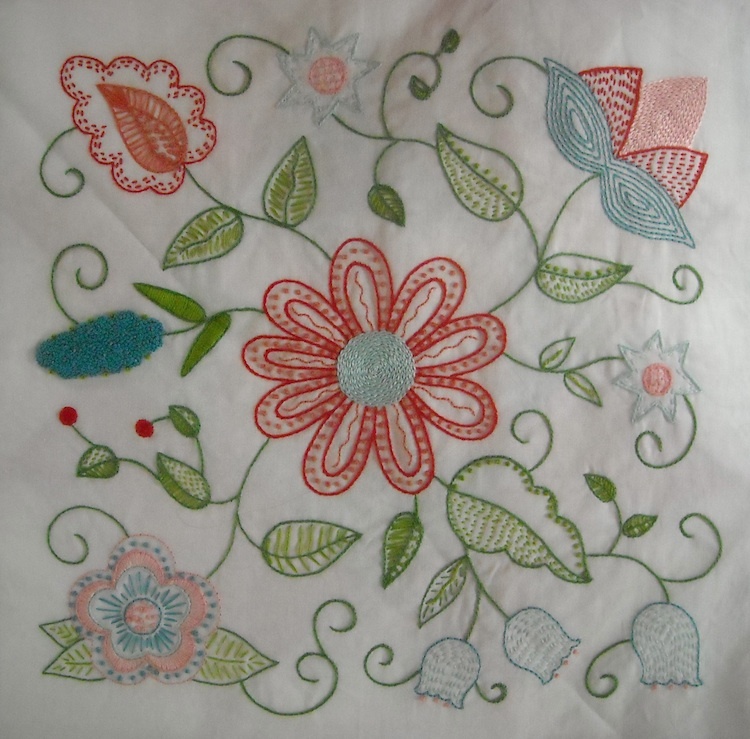 Which you do just depends on how much you like embroidery, how involved you want to get with it, and how comfortable you are with various stitches. For the plain version, I used only one color of thread, three strands of floss (you’ll need at least 2 skeins), and used only two stitches: Outline Stitch and French Knots (see links below for help with these stitches). For the fancy version, I used 8 thread colors, matched to the fabrics I’m making my quilt out of. You’ll need at least 1 skein of each color and possibly more of the greens for this block. I used three strands for this block as well. If you click on the name of each stitch, it links to a post or video on how to do that particular stitch, just in case you need help learning how to do them. Also keep in mind that you do not have to use the same stitches and fills that I did. You can do whatever pleases you or what you feel comfortable with on your blocks. On the printed pattern, you will see black lines and red lines. If you’re doing the plain version, you’ll only need the black lines. My fabric was white, so I could see through it without light. You may be able to as well. I’ve used lots of different types of marking pencils, but for these, I just used a mechanical lead pencil, nothing special. Use whatever you’re comfortable with, and something that won’t show when you’re finished. Now, the moment you’ve all been waiting for . . .
Here’s the download: Hazel’s Summer Wildflowers, Block 1. 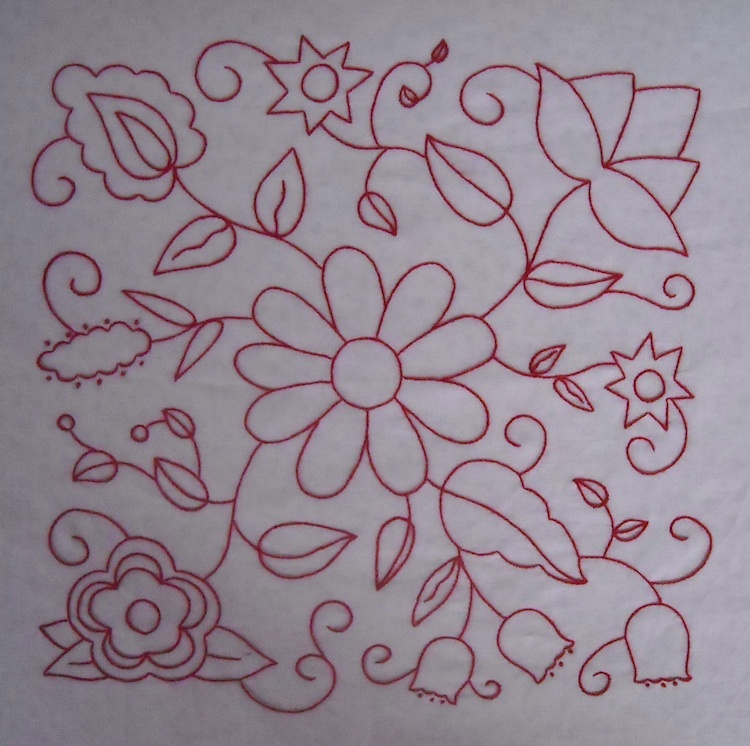 I’ll be back in a couple days to show you an alternate project that I made using my plain Block 1 done in redwork. Stay tuned. Meanwhile, you have fabric to cut, marking to do, thread to gather. Get busy! Okay….I’ve got to go get some thread and get going now so I don’t fall behind! I purchased floss in the brightest shade of blue you can imagine. Blue is not always my favorite color, but this shade kept catching me as I turned those little trays in the floss vendor. So now I can call mine Blue Rubicon………….. I am so going to do this!! Is there a chance you could give the colors of thread that you used for each block made? This pattern is so beautiful and versatile! Thank you!